Directions to North Ranch Financial Group, Inc. | North Ranch Financial Group, Inc. 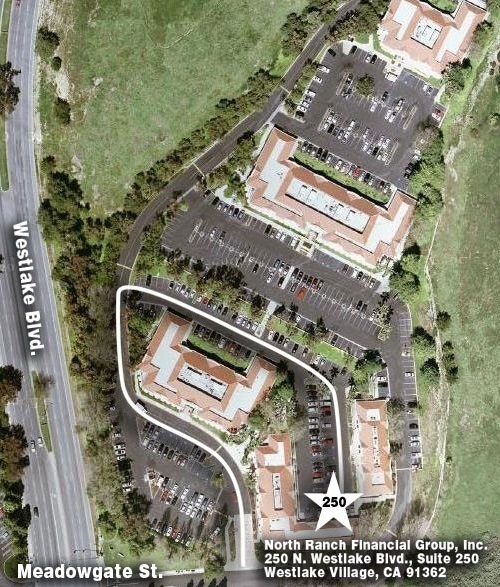 Directions to North Ranch Financial Group, Inc.
Take the 101 Freeway north to Westlake Boulevard exit and turn right. Make a right turn one block north of Thousand Oaks Boulevard on Meadow Gate Street. Make a left turn at first driveway. Take a right turn behind the 310 building. Follow the driveway to the back and we are in building 250 suite 250. If you have any trouble locating us, please don't hesitate to call the office at (805) 495-8166. Take the 101 Freeway south to the Westlake Boulevard exit and turn left.